Download WeatherBug to Know Before™. Access the world’s largest network of weather and lightning sensors for the most accurate forecasts, the fastest alerts and more. Plus, our app is sleek and polished. ;Only our data is real-time, which allows us to see weather threats first, provide better forecasts and give the fastest alerts to severe weather! And only we measure “Total Lightning” so you get exclusive Spark™ lightning proximity alerts for your current and saved locations. 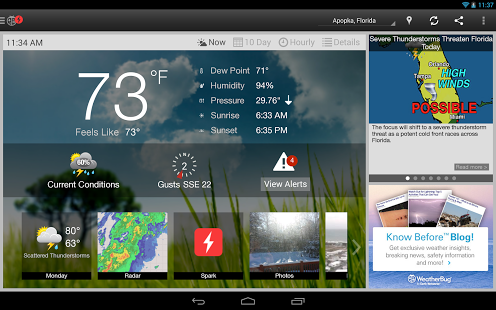 Stay safer with WeatherBug. 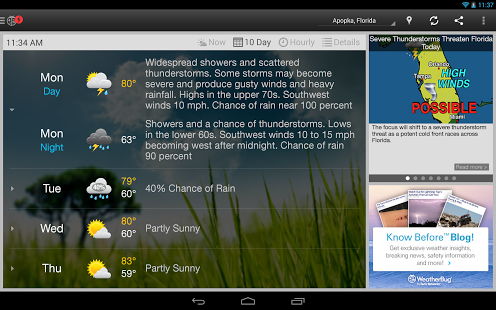 ;As you’ll see from the “short” list below, WeatherBug has more awesome data and content than any other weather app. ;Enjoy these useful features;• Spark™ Alerts – Unique and beautiful, Spark™ turns your smartphone into a personal lightning detector. Get exclusive real-time, minute-by-minute, mile-by-mile lightning proximity alerts from our network. 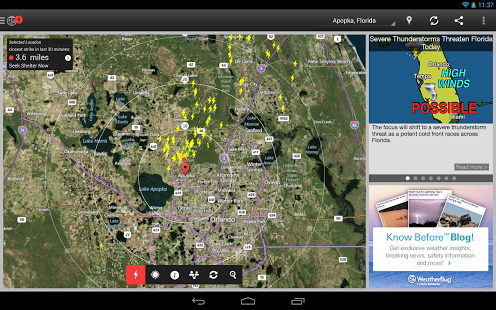 Check out our live lightning map to see lightning strikes near and far! ;• Real-Time Enhanced Pin-Point Forecasts for 2.6 Million Locations Worldwide – The most accurate current, extended and hourly weather forecasts for your neighborhood and beyond from the world’s largest weather and lightning sensor networks. ;• Exclusive DTAs & Severe Weather Alerts – Minutes Matter. Our Dangerous Thunderstorm Alerts (DTAs) provide the fastest warnings to severe weather. Plus, get National Weather Service (NWS) warnings and watches to stay informed of severe weather conditions at all your current and saved locations. ;• Extended 10-Day Forecast – Weather happens. Get the most accurate extended forecast and Know Before™ 10 days ahead. ;• Enhanced Interactive Maps – Enjoy our enhanced maps with multiple layers such as Doppler radar, humidity, pressure, wind speed, high/low forecast, traffic, satellite imaging and more! ;• Live Weather Cams – View live images from over 2,000 weather cameras across the U.S. to get a better picture (pun intended) of the weather at destinations near and far. ;• Photo Section & Albums – We’ve collected magnificent photography from our users for your viewing pleasure. Now categorized into albums, finding awesome photos has never been quicker or easier! Come see what others are sharing and enjoy the scenery! ;• Photo Submission & Sharing – Snap, send & share. Send us your best photos and share your moments with millions of WeatherBug users. ;• Spotlight section – Get “News of the Day” and other breaking weather stories from the WeatherBug Meteorology team to stay up-to-date on the weather around you. ;• Hurricane Center – Get the latest news on hurricanes, investigate past hurricanes and track current hurricanes as they happen! ;• Lifestyle Forecasts – Do I run outside or go to the gym? Should I cancel tomorrow's picnic? Our new Lifestyle Forecasts identify and analyze specific weather parameters to advise you on how best to stay comfortable and have fun! ;• Customizable Home Screen – Customize your home screen with newly added background themes and rearrange your live tiles to get the info that matter the most to you at-a-glance. ;• Multiple Language Support – Get forecasts and alerts for your neighborhood and the world in Spanish and Portuguese! ;• My Location – Automatically updates your weather information based on the closest weather station to you in your neighborhood through GPS. ;• Multiple Saved Locations – Save all your locations without any restrictions. ;Be prepared. Know Before™. 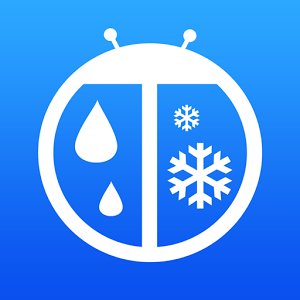 Download the app used and loved by millions, voted the “Best Weather App Ever” and trusted as a “Best App for Moms”, WeatherBug!